4 FREE SUAVE PROFESSIONALS SHAMPOO/CONDITIONER SILVER LINE!!! 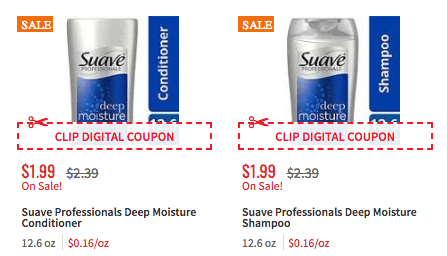 NOW TIL SATURDAY 10/27/18 SHOP RITE HAS SUAVE PROFESSIONALS NEW SILVER LINE ON SALE FOR $1.99 EACH!! *** KEEP IN MIND ALL STORES DO NOT ALLOW OVERAGE, FOR THOSE THAT DO PLEASE HAVE SOMETHING IN YOUR CART TO ABSORB THE OVERAGE. NO CASH BACK WILL BE GIVEN! !